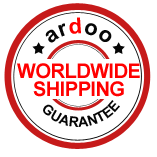 Goods ordered from the Ardoo Caresafe Limited online shop are sent via UPS. When the hoist has left of premises we will email/text a parcel tracking number to the purchaser. For information about delivery costs please refer to the shopping cart.